In 2003, I couldn’t eat anything without almost blacking out from the pain. It didn’t matter what it was, I couldn’t eat. It was affecting my ability to live my life and take care of my kids; there were days that I was afraid I would crash while driving because I hurt so much. The gastroenterologist scoped me up and down, and had no answers. I decided to try acupuncture as a last resort. Within 3 weeks, I was no longer suffering from blackout pain levels, and within 3 months, I was eating almost normally. Strangely enough, it was not my first time to get acupuncture. For whatever reason, I didn’t consider it even though I knew it helped! I had suffered horrible morning sickness during one pregnancy. I couldn’t even think about, look at, or smell anything having to do with food word without getting nauseous. I would have to pinch my nose and close my eyes to pull out the lunch that my husband had prepared for my 3-year old from the fridge, or else I was heading straight for the bathroom. The anti-nausea drugs didn’t work: Reglan gave me a splitting headache that made the nausea even worse! One morning I read an article on how acupuncture helped chemo patients suffering from nausea, and I booked my first appointment for the next day. Within 9 treatments, the nausea was tamed. I left treatment and went on to have a successful pregnancy. So for whatever reason, it took me a while to remember that acupuncture could help with my digestive issues. During the acupuncture treatments, I realized that some of my physical problems stemmed from my stress and unhappiness with choices I was making about my future career path. I ditched the idea of going to law school and enrolled in a graduate program of acupuncture to bring healing to others. I wish, during my struggle with fertility, that I had known then what I know now about how acupuncture and herbs can help with fertility. That pregnancy when I got my first acupuncture treatment for nausea? It was my fifth pregnancy. I had suffered 2 miscarriages, had my first son, suffered a third miscarriage, and then had my second son. Testing wasn’t as extensive 23 years ago, and the MDs didn’t have any options to offer me to diagnose or fix my fertility issues. I went home to visit my Dad after the second miscarriage, and as a special treat, he booked dinner at a lovely upscale restaurant known for its excellent food and desserts. The wait staff wore tuxedos, the plates were real china, and the food was beautifully presented. I broke down in that restaurant, sobbing into my napkin for 2 hours surrounded by white linen tablecloths, real silverware, and the quiet hush of an upscale establishment while talking to my Dad about how scared, upset, betrayed by my body, angry at my body and the world I was in. What if I couldn’t have children? What then? Fortunately, my third and fifth pregnancies were successful without intervention, but the heartbreak of miscarriage and that feeling of helplessness is nothing I want anyone to experience. 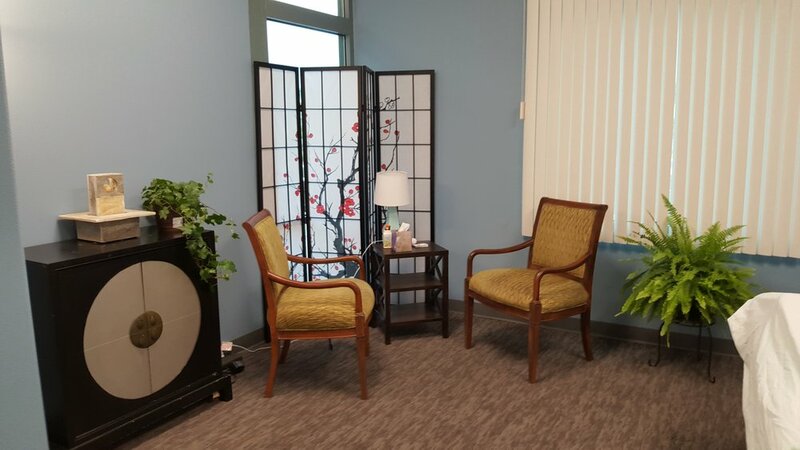 Once I graduated from acupuncture school, I decided that whatever the problem, I wanted to focus my practice on helping my patients help themselves by creating lives that support their health through acupuncture, Chinese herbs, nutrition, stress management, and joy. I also continually get additional training in fertility because I know how hard it is to want children, and not be able to have them and to feel like there aren’t options to improve the situation. There are LOTS of things that a woman can do to improve her fertility. Likewise, there are LOTS of things that everyone can do to feel better and thrive, whatever the issue. My digestive issues are still something I deal with occasionally: what I have learned is that when I take care of myself, I can eat, and when I don’t take care of myself, I can’t. What are your symptoms telling you? Some patients have mentioned that it seems that things have been difficult. I believe that those difficulties have made me more sympathetic to the issues my patients face, and more determined to help my patients learn to take those troubles and turn them into opportunities for growth, learning, and joy. I believe you CAN live a life of joy and create a life that lets you thrive. I have my Master’s in Acupuncture (M.Ac.) and have post-graduate certification in Chinese herbs. I am nationally board certified by NCCAOM in Oriental Medicine, including acupuncture and Chinese herbs. I am licensed by the state of Nevada as an Oriental Medicine Doctor (O.M.D.). I was appointed by the governor of Nevada to serve on the Nevada State Board of Oriental Medicine, where I hold the position of Secretary/Treasurer. I have had specialty training infertility, pain, stress management, depression and anxiety, immune system diseases, needle-free techniques and Chinese herbs. I also have extensive experience in treating children. I love my work; my patients are some of my best reminders that I have to listen to my own advice about slowing down, loving life, and creating a life where I thrive. I have two children and four cats. I’ve lived in California, Texas, Florida, Iowa, Ohio, Maryland, Japan (Tokyo), Okinawa, Germany (Weisbaden), and England (Newmarket). As a result of living in Japan for 9 years, am fluent in Japanese. After traveling for 40 years, Las Vegas is the place where I am finally setting down roots. I have made deep friendships here, and the Spring Mountains are quite simply the most stunning environment I’ve ever lived in. I’m so grateful that I get to do the work I do! Let me help you feel joy, resolve your issue whatever it is, empower you to create health, love your life, and thrive!